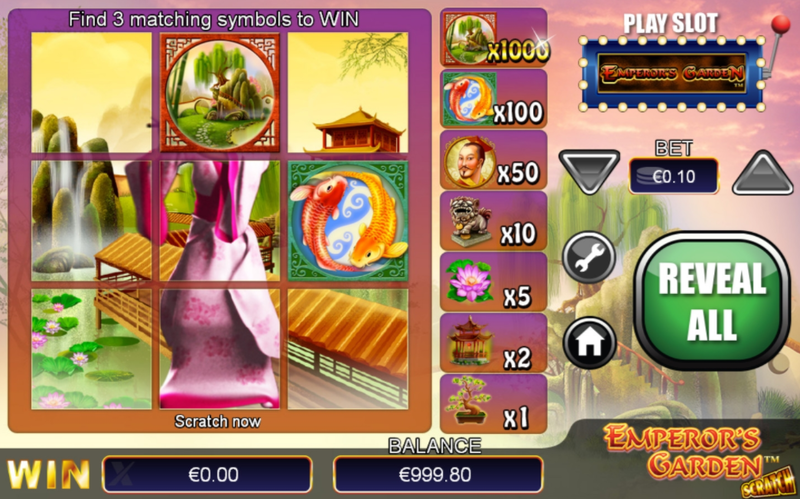 Become the King of your own Kingdom at EasySlots.com and stake your wealth on this oriental themed scratch card game. Wander through your vast and luscious garden turning over the mystery cards and win big on this far-eastern classic. NextGen is very popular amongst their audience as they provide exciting gameplay experiences and have become one of the market leaders, always delivering entertaining and engaging games. The company has been founded almost two decades ago and provide extraordinary entertainment ever since. The developer team prides themselves of high-quality video slots and the energetic dynamic. With a wide range of different themes there is a game for everyone in their repertoire. NextGen delivers original and creative products with innovative game design choices. A full list of all the new slots is here. Emperors Garden will welcome you to the beautiful landscape of an idyllic Chinese garden. To play the game you will have to purchase a 3x3 scratch card, which on the cover side has a Chinese woman playing a flute in her pink traditional dress. Behind her is a lake with lotus flowers and a bridge leading to a big Chinese building. The scratch card is positioned to the left of the screen, next to it is the paytable and to the right hand-side are all the important playing controls, including a button that will lead to the slot version of this game. The art-style is extremely detailed and will immerse you very quickly into the Asian theme. The representations are very well done and the symbols that you can uncover on the scratch card are all theme related. There is the framed Asian landscape, an orange and a red pretty koi fish swimming around each other, the powerful emperor himself, and an Asian statue, a pink lotus flower from the lake, a Chinese building and a gorgeous bonsai tree. To form a winning combination you will have to match three identical symbols. All symbols will pay out different prizes which you can check on the paytable. The highest paying symbol is the landscape and the lowest is the bonsai tree. There are no bonus features or special rounds in this game but the base mechanics will offer you a relaxing and entertaining gameplay experience. To scratch off one of the cards and see if you have three matching symbols you will have to place a minimum bet of only 1p or if you prefer up to 2 pounds. Once you have purchased a scratch card you can decide yourself if you would like to scratch them off individually or if you use the reveal all option which will show you the entire card. 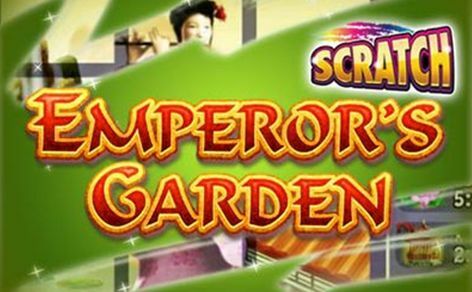 Emperors Garden Scratch is a great and soothing variant to the video slot version. The intriguing art-style is nicely detailed and represents well the Chinese theme. The symbols are all theme-related which adds a lot to the game feel. The mechanics are very simple to understand and will make you immerse into the game flow very quickly. Emperors Garden Scratch will offer you a relaxing gameplay experience and is the perfect fit for anyone that is a big fan of the Chinese culture. Once you're finished with this scratch game why not try online poker?